Ok, so I might be making it sound more serious than it is but I am in Harefield Hospital currently as I came back from Ireland with a temp, headaches, extreme fatigue and a slight drop in lung function - boo! Although in all seriousness I was feeling very crummy and a little worried about it too to be honest and I never really worry about health things. I don't see it as something I have much control over other than how I feel about it and I don't worry about stuff until last minute when I have to - like I didn't worry really about end stage CF until I was in the literal end stage on life support and thought 'Oooh crap, maybe I am in trouble here!' hahaha and then I think I had a breakdown which was fun. There was a bit of hassle getting a bed so I think that this got left for far longer than it should have (although my CF clinic were absolutely brill, as always 💜) but saying that this isn't all Harefield's fault, they just don't have the money and resources that they deserve which is so frustrating for patients and staff alike. However that's a rant for another day! This post is all about me, lololol. Looking rough but I'm not a morning person ok?! Am not used to these 6am wake up calls haha! 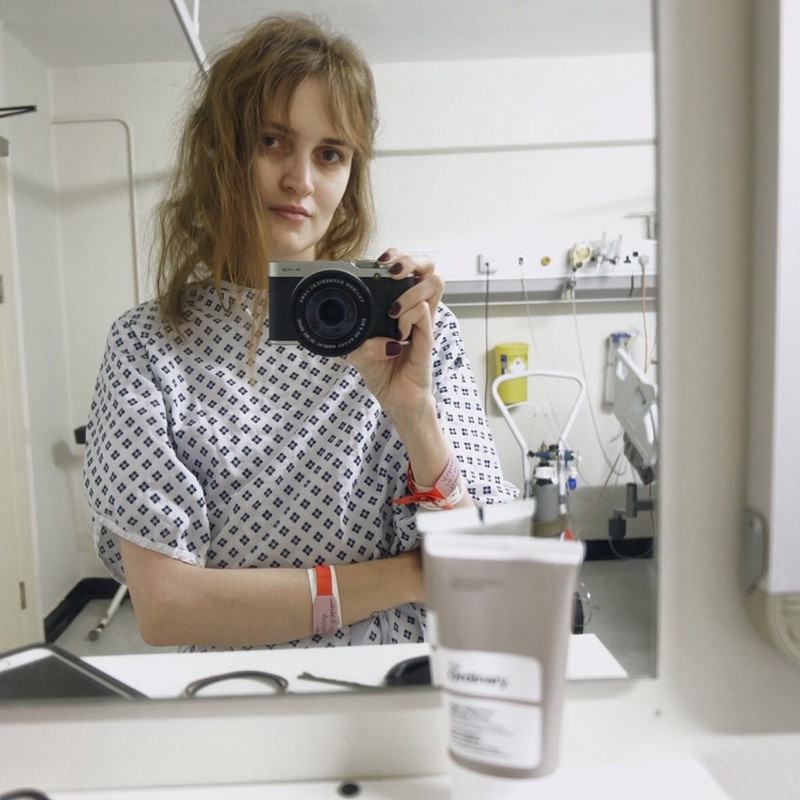 I got here on Tuesday evening and waited around a bit (but it wasn't too bad as I have Arcade Fire's new album, I snuck in a cheeky shopping trip and my mama is staying close by so I have company) then I had a bronchoscopy and biopsy of my lungs this morning. It was kinda nice because I bumped into one of the amazing consultants from my ICU days, he was in charge of the ECMO so he's v clever and he was just an all round brill man too. When I was on ECMO he showed me a load of photos of people before and after transplant and generally was fab at keeping mine and my family's spirits up and he had a lot of time for us all answering any questions we had. However he has only seen me in 'hospital mode' looking rough in my jimjams so I hope one day he sees me looking vaguely normal haha. They're pretty sure it's just a viral bug as my bloods have been fine and from what they saw from my bronch and ct scans nothing showed up. Now I just have to wait for an ECHO and another ct scan as well as the results of the biopsy so will be here til Tuesday at least I think. So I thought I may as well try and have a catch up with you as it's been a while! I'll try and write my Ireland post while I'm here and also a Very Important Post which I am late writing up which is bad but I've been struggling to find the words. But I was *reflecting* a little and realised that this time last year I was moving from ICU to HDU after transplant, still unable to walk, still batsh*t crazy and still scared of the super lovely physio hahaha. What a difference a year makes, as even though I'm ill I'm still able to walk, I bet I could run if I wanted to, I don't think I am crazy and I'm not scared of anyone - went down for my bronch like a big gurl and if I'm to make a small confession I actually very much enjoyed the general anaesthetic as I needed a nap because the night before I had a nightmare about Dear David. On reflection maybe I'm not a big gurl. I know it's all a load of lies but it still scares me and because I'm a 4 year old in a 24 year old's body I opened the curtains on the door because I was afraid in the dark and then I got frightened that Dear David was on the other side of the window. Or if it wasn't Dear David it might have been the lady on the ward who shouted at me in the bathrooms at 4am the other night 'Hurry up, that's my favourite toilet!' I love hospital. So subsequently I was awake looking at puppies on Pinterest til 5am then they came and woke me at 6 so I could get ready for my bronch. Anyway though, I do hope you're well and thank you for the lovely messages! It's very kind. You do know who is there for you when you're ill and when things are going well for you too in fact. My eyes are WIDE open now!